Lots of action is packed into this Legend Teamwork Award. Several elements in the award are raised providing a 3-dimensional look. 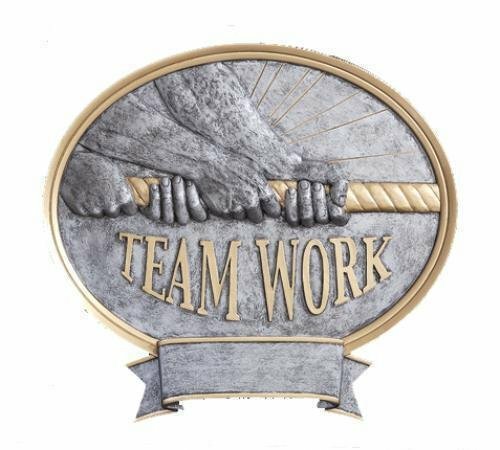 Everyone pulling together is the theme in this Teamwork award. A thick rope with two sets of hands firmly holding on giving the impression of pulling in one direction is depicted while the word "TEAMWORK" is prominently displayed to complete the scene. This oval award measures 8 1/2" X 8". A large area at the bottom of the award can accommodate your personalization needs while the gold and pewter finish complement the look of the award. This item can either be hung on a wall or placed on a desk using the included stand.